California Grown Flowers Month is Almost Here! What’s Your Plan? In 2017, the California Senate declared June to be California Grown Flower Month. When announced, the resolution noted the designation was designed to recognize and honor the men and women of the California flower industry for their dedication and productivity. The resolution also recognized the flower industry’s impact on the state’s economy: creating 145,665 jobs, generating $12.2 billion in business activity and creating $1.1 billion in additional taxes. 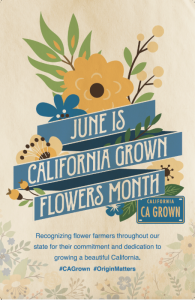 With June fast approaching, what do you have planned to celebrate or recognize California Grown Flowers Month? CCFC has several promotions in the works in conjunction with retailers. We’ll also be spreading the word through various Commission communication channels and on social media. Tell us what you have planned and we’ll help spread the word!